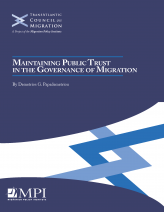 As governments around the world face increasingly complex migration management challenges, the difference between success and failure can often hinge on the ability of policymakers to win public trust. When there is little or no trust in a government’s ability to manage immigration, the capacity to test creative immigration and integration ideas is severely curtailed, and the penalties for missteps become disproportionately higher. The greatest threat to public confidence in the immigration arena is the persistent belief that government is unequal to the task of managing immigration well—that the system is “broken.” This threat cannot be underestimated. Even an immigration system that in fact delivers most of its programs well can still be thought to be failing if the public perceives significant disorder in a major component of its portfolio. This Transatlantic Council on Migration report outlines the principal, interlinked challenges that policymakers face—including external forces and the structure of government itself—and reflects on why it is so crucial for immigration policymakers to win back public confidence, as well as the role of sound migration governance in doing so. Public confidence hinges on not just concrete policies and their results, but also on how government activities and outcomes are interpreted and presented to the public. Creating an honest but nuanced narrative about immigration and how it benefits society at large—coupled with straightforward explanations of the tradeoffs that certain decisions require, and thoughtful policies to address the inevitable losers from immigration—is essential to gaining and maintaining trust in the immigration system.